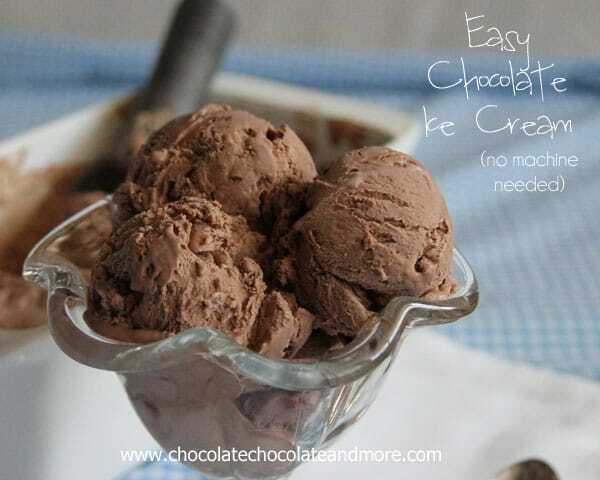 Easy Chocolate Ice Cream - Chocolate Chocolate and More! 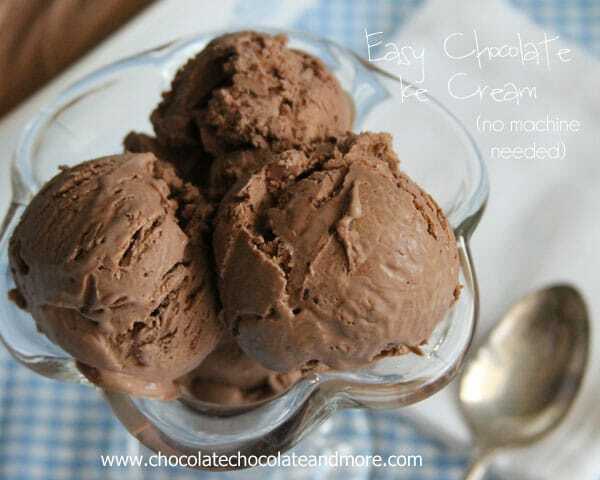 Easy Chocolate Ice Cream-no machine needed! I didn’t believe ice cream could be good without an Ice Cream maker. I’d seen all these recipes floating around last year. My friend Dorothy at Crazy for Crust even did a round up post of them. I had to find out for myself. I grew up on machine made ice cream. We had an electric machine but I remember using a hand crank machine with my cousins when I was little. Everyone had to take a turn. And then another turn. By the time the ice cream was done we were so ready for that ice cold, still soft ice cream. It didn’t matter what flavor it was. It was hot outside and that ice cream sure was cool sliding down our parched throats! Chocolate was always my favorite, of course. So rich and creamy. So I had to try this “easy” Ice cream. It’s heavy cream and sweetened condensed milk. Then you add in your flavors, your extras, to make it special. Could it really be that good? I’m here to tell you, I may never use that machine again! Less than 10 minutes work, and the ice cream was in the freezer. When I served it to the kids they had no idea I didn’t use the machine. It was creamy, it was smooth, it was everything “real” ice cream is supposed to be. Stir together sweetened condensed milk, cocoa powder and vanilla in a medium bowl. Set aside. 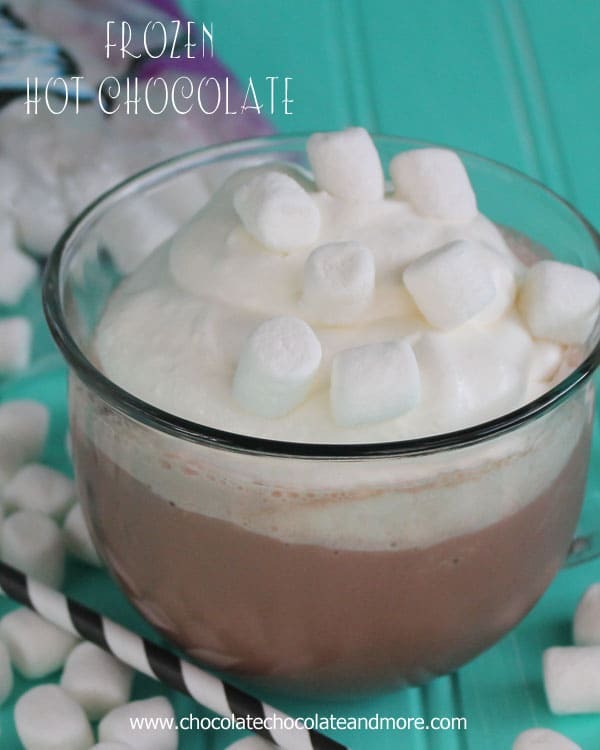 Fold sweetened milk mixture into whipped cream. 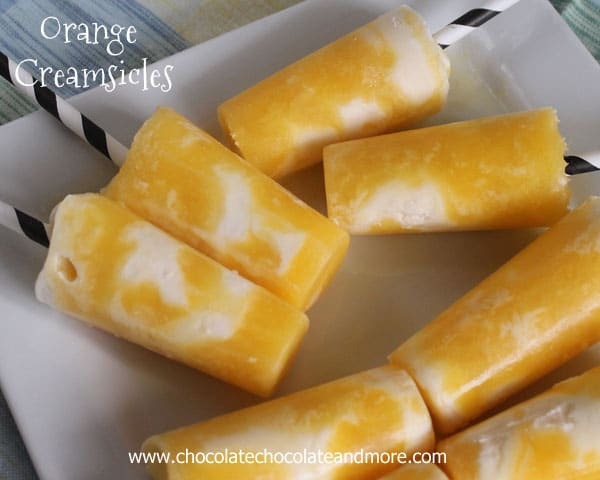 Pour into a 2 quart container, cover and freeze for at least 6 hours or overnight. You can count on many more “easy” Ice Cream recipes from me soon. I’m hooked! That looks incredibly rich and perfectly textured for such an easy recipe, I can’t wait to try it! I am so old fashion, I love my machine and just bought a second one but I do agree that the noise is crazy loud and so disturbing! This on the other hand looks amazing! Never would of thought it was done without a machine! I can’t believe that you can make ice cream without an ice cream maker! This is awesome! I guess I don’t need this clunky appliance then. ISN’T IT LIFECHANGING??! Sooo amazing! and I love your recipe-the chocolate looks so perfectly rich and creamy! Oh wow girl! 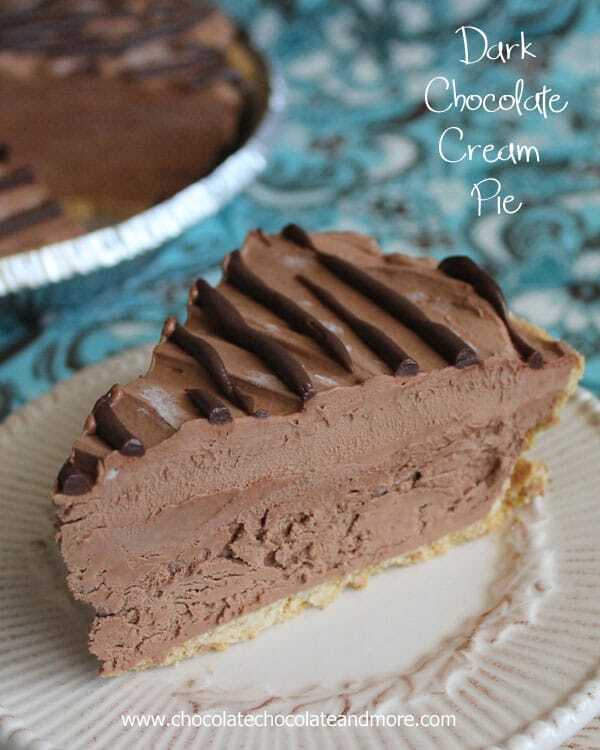 I love me some chocolate ice cream and this looks absolutely fantastic!! This is WRONG on so many levels! I hove to try it now!!!! Thanks! Any idea if I could sub something for the condensed milk? I’m not big on canned stuff. Saw this recipr and since my son and his wife wete visiting I hsf a couple people to try it on. It’s very smooth and great chocolate ice cream!! Never thought it would work, and left it in freezer overnight. And just becausr I had doubts, I had to have a spoonful when I got up at 7am. It really is awesome! And very tasty! 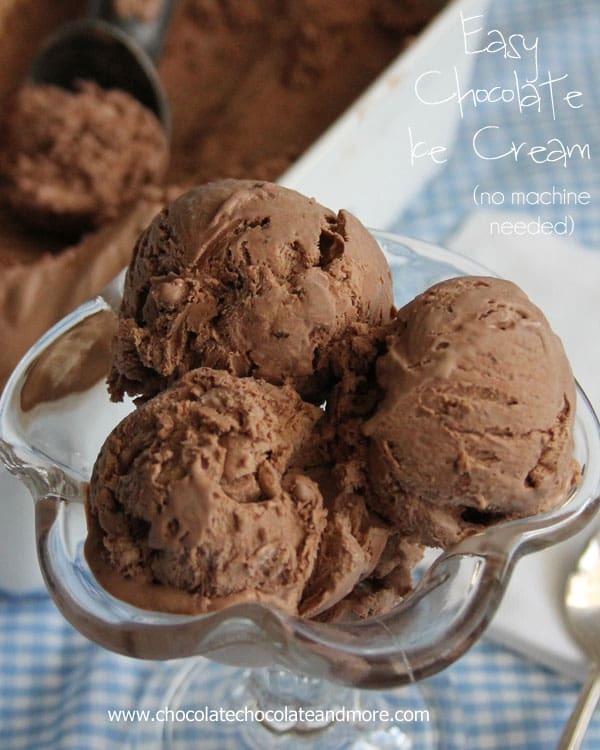 I love chocolate ice cream and my son’s wife asked if using this same recipe, could other flavors be made? Told her I would ask you. Absolutely! The base is the sweetened condensed milk and the whipped heavy cream. From there add what ever flavor you want! I have the ice cream in the freezer as we speak. It was very easy to make. I made it into a rocky road. Can’t wait! Two more hours to go. I couldn’t wait to try this since I live on an island in the middle of a lake in upstate NY. Finally did it today. How do you spell WONDERFUL!!! 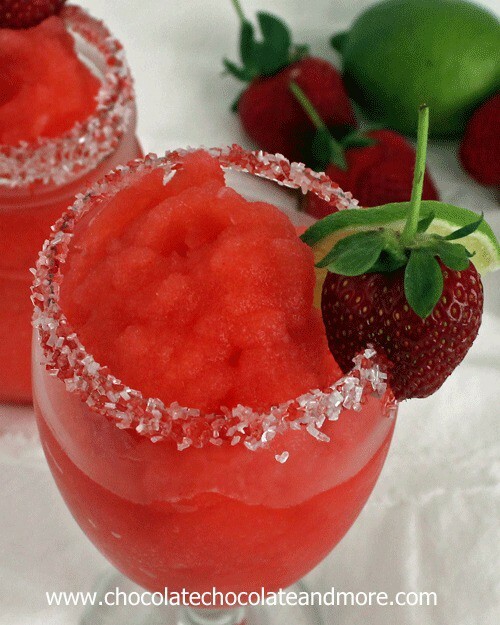 So easy to make and absolutely delicious and rich tasting. 10 STARS for this one. Can’t wait to try the vanilla one. Sounds great! I have got to try it! In place of the coco powder maybe strawberry Nesquik powder can be used to make strawberry ice cream. Or instant pudding powder in place of coco powder for other flavors. those would be great change ups! I love this no-machine version of ice cream, Joan. It’s the best – I seriously can’t believe how delicious and easy it is! I haven’t made a chocolate version yet. I’m definitely pinning so that I can try this. Your ice cream looks absolutely perfect! I wonder, could you use cool whip instead of the heavy cream? I tried this but i made Pistachio Nut. OMG!!! It was soooooo good. Thick and creamy and soft all at the same time. I will most definitely be trying it with many different flavors. One recommendation to those choosing to use instant pudding mix in this recipe, add one cup of milk or evaporated milk to is. I used the Pistachio instant pudding and without the extra milk it was more like frozen mouse than ice cream. The fix was easy though. I just broke up what i had frozen already and added the milk and it mixed together beautifully. Now I have the perfect ice cream. Mmmmmm, I may never buy ice cream from the store again. I can’t wait to try your version! Just put a batch in the freezer! Super easy, and the mix tastes amazing – always a treat to lick the bowl lol! Am already thinking of cool flavours I can add:peanut butter, mango, orange, salted caramel, popcorn… Fab. Love it…. The ice cream so easy to make and delicious out of this world. I added chopped up dark chocolate chunks to the ice cream. Can’t wait to try making the one with Pistachio pudding mix. Thanks for the recipe. OMGoodness!!! This is truly life altering. I can NOT wait to try this! can i sub the vanilla for vanilla extract or vanilla oil? it’s practically impossible to find vanilla in the grocery stores at where i live. Yes, I’m sorry I wasn’t clear in the recipe, I use Vanilla extract. 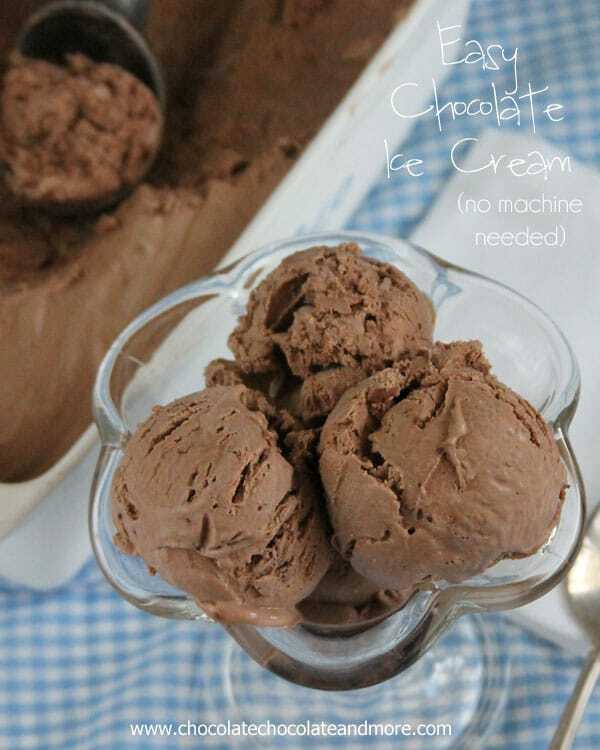 i just made a batch myself, basically the same, but instead of cacao, i added a tablespoon instant coffee and a little coffee liquer to dissolve the coffee powder, the rest was the same as your recipe, result, super delicious coffee icecream, i am a huge fan of icecream made this way! will try this chocolate version soon…yummm…though almost too easy and with ingredients always in the house, this is a danger for the waist line…oh well…. Your coffee ice cream sounds delicious! Looks so good, really gotta try it. Hi there! I’m super excited to make this, but I was wondering, do you think I could make this in an ice cream maker? I was hoping to do this because it would freeze it quicker. So do you think it would turn out all right if I prepare it the same way but put it in my ice cream machine long enough to let it freeze and then I set it in my freezer to solidify more? Sure it would, this is just a recipe that will work if you don’t have a machine. Hey!! I can’t wait to try this!! Just a question. . 1 can of unsweetened milk would be how many grams or cups? I must say, this ice-cream absolutely rocks. It’s so rich and creamy. The chocolate can really be tasted and it’s a lot better than the bucket ice-creams available from the stores. It has this Haagen Dazs Belgium Chocolate ice-cream flavor to it. Definitely a keeper! 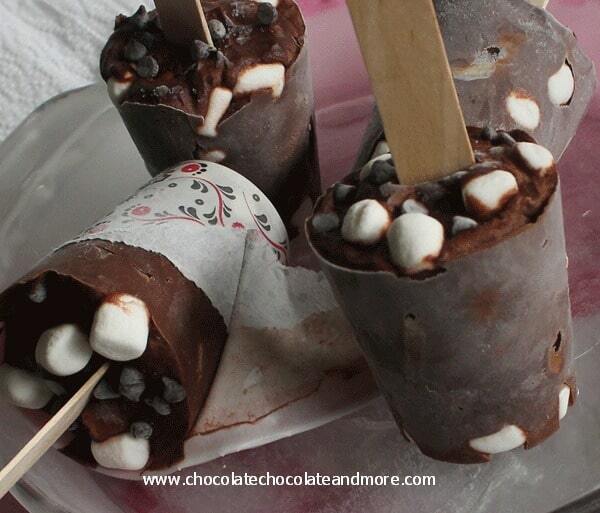 I’m going to try it with chocolate chips next time! So glad you enjoyed it. 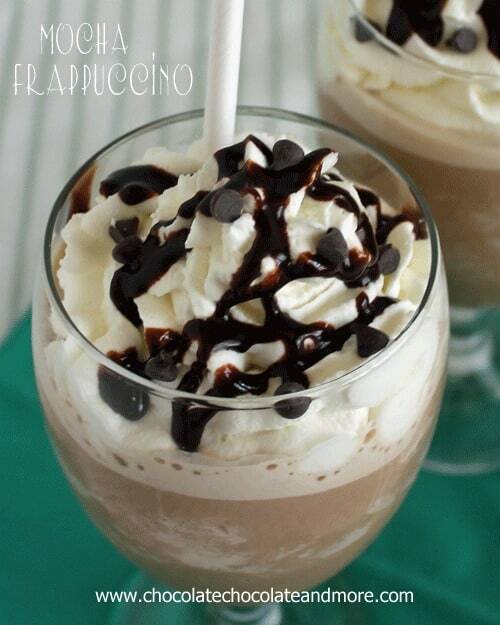 You can never go wrong adding chocolate chips to anything! 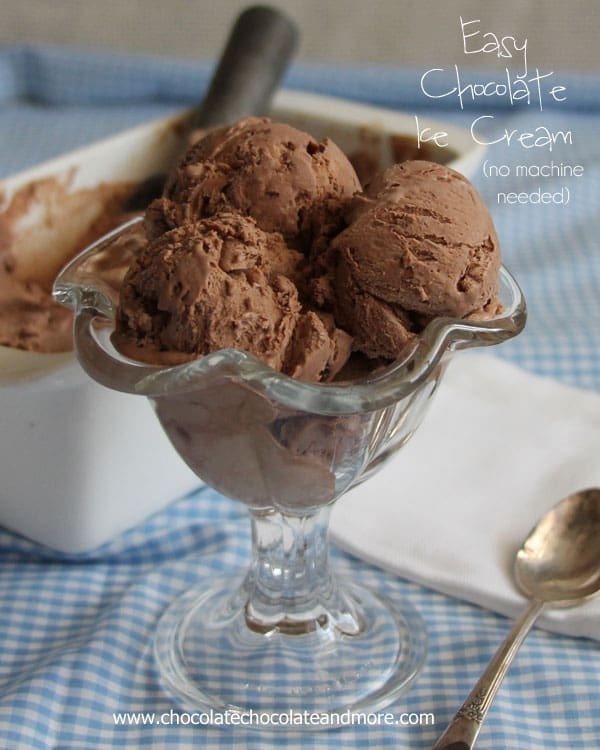 I was on the hunt for an ice cream maker, when I came across this recipe. I expected it to have crystals or not be ‘quite’ good enough, but it’s perfect. I added toffee bits the first time I made it and a chopped up caramilk bar the second time. Both are deelish! I can see varying additional ingreds for change of flavoring, but the base is there! Smooth and creamy. Yum, yum, yum. And very fast and easy to make. So glad you enjoyed it and I love that you added to it! Its so awesome. I tried it at home . its super easy to make.all the ingredients were available at home. I also tried to make coffee icecream and it tasted so delish. 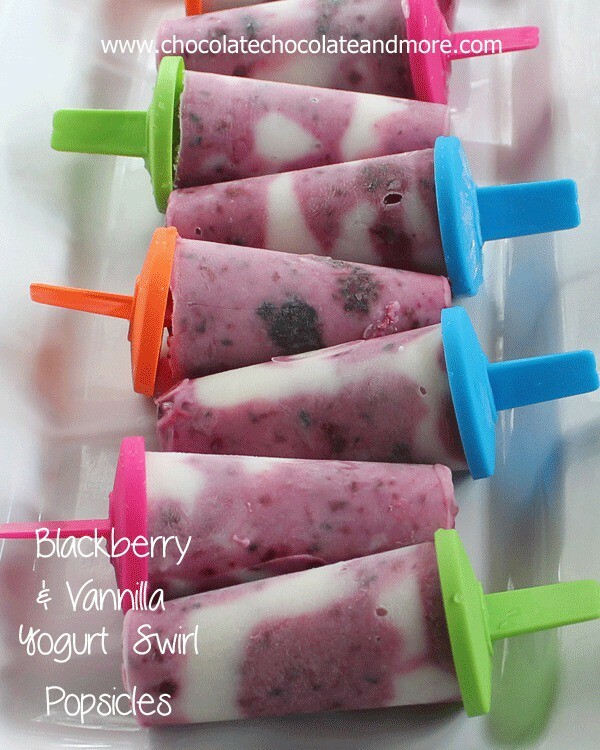 Thanks for sharing this recipe for us, can’t wait to trie other flavors…. I made this into an ice cream cake for my son and it was ahhhmazing!!! I froze it in the same shape pan as the cake and covered it all in chocolate ganache. Because he wanted mega chocolate I topped it off with cocoa whipped cream. The whole family LOVED it! Can’t believe it’s so easy and actually works!! Thanks so much!! I assume this recipe uses a 14oz can of sweetened condensed milk? I also have 7 and 3.5oz cans in my pantry. Yes, it’s a 14-ounce can. I’ve never seen the smaller sizes, I’ll have to check for them the next time I’m at the store. All I have is sweetened ground cocoa, Ghirardelli. What do you suggest in using that. Since the sweetener in this recipe is the sweetened condensed milk there’s not really a way to adjust this recipe for using a sweetened cocoa. I made a chocolate mousse last summer, which I froze and kind of made ice cream out of it and it was good too, but I get the feeling that this one is going to be so much better. Well I made the ice cream and I added some desiccated coconut to it, which worked well, but the condensed milk that is available here in Slovenia, is not the same as the brand that is available back in the UK, it’s just for making coffee, so it wasn’t as sweet as I was expecting, but it was still delicious, I made 2 ltrs and there is one left in the freezer. Next job is to make my own condensed milk. 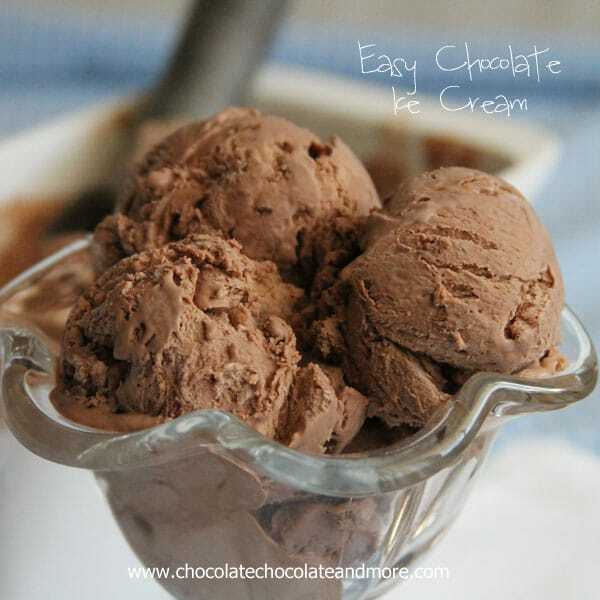 Hi Joan, I’m from Indonesia, I’m so glad I found this recipe as I thought making good ice cream was complicated. First attempt, the texture was pleasantly smooth but it was too sweet for my taste buds. I don’t know if the condensed milk here is sweeter than in the US (we only have 325 gr can, or approximately 11oz but still too sweet). So second attempt, I double the cocoa powder and added about 3/4 cup of milk and a pinch of salt to lower and balance the sweetness level, it turned out perfect! This is definitely a keeper for ice cream base recipe, I think I won’t buy commercial ones anymore. Thank you Joan. So glad you were able to make the recipe work for you! I just stumbled upon your no churn roundup and this recipe and used it for my first time making no churn ice cream. i won’t like – I had my doubts that it wouldn’t taste like ice cream being so easy, but OMG, it is amazing. 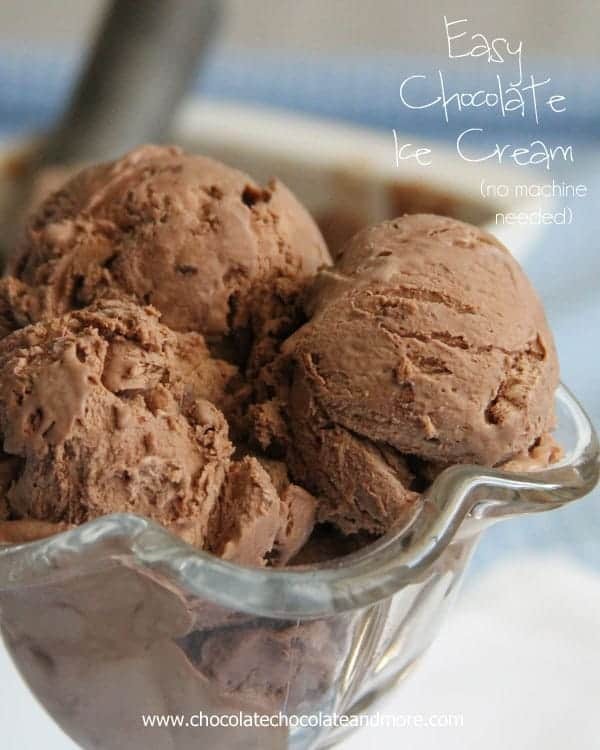 I made the chocolate since that’s what the hubs likes and he, who hates these trendy kind of recipes, said this was one of the best ice creams he’s ever had. So easy and so chocolatey. I mixed mini PB cups in this time and I can’t wait to try other mix-ins. Thank you!